Creating a tree guild provides a natural, self-sustaining, useful landscape that encompass several plant species, each with its own purpose and benefit to the others. What is a tree guild? This sort of planting plan starts with a vigorous, productive main tree and graduates gently to mutually sustaining sub-plantings. It takes some time to achieve and success depends upon the variety and diversity of the lower plants. What is a Tree Guild? A useful way to look at landscaping is holistically. Taking the entire concept into consideration and opting for plants that complement each other helps minimize upkeep and builds a strong scaffold for each species to thrive. Fruit tree guild design is one way to optimize a planting space and create a more diverse producing food garden. Knowing how to plant a tree guild provides a practical permaculture that withstands stress and enhances each plant’s health. Permaculture is the planned design of agriculturally productive systems that have the characteristics of a natural ecosystem. 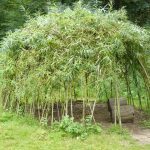 Tree guild permaculture takes the concept one step further by utilizing the tree as the main anchor and adding elements into the area that produce food and creates a stable environment. You don’t have to be a professional landscaper to delve into fruit tree guild design. It does, however, take some research and a concerted plan for the successive plantings. Start with a vigorous, producing fruit tree and work your way down from there. 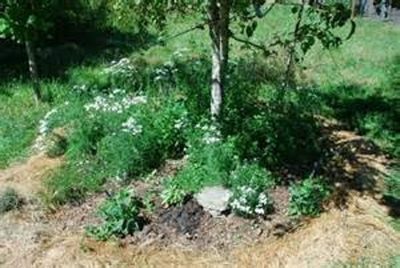 Tree guild permaculture is a perfect melding of plants that work together to sustain the area and provide a productive space. The whole goal is to create a unity of plants with individual beneficial attributes and uses. As you consciously plan your garden under a fruit tree, take into consideration the attributes you need from each species. Every plant should give something to the area and help sustain the entire concept. These plants will provide nitrogen fixing, fertilization and pollination optimization, pest prevention, diverse food crops and help retain moisture and control weeds. That might seem like a lot to ask for from a handful of plants, but careful reflection on the options available to you will help whittle down the most beneficial specimens. You will need understory plants that enhance the growth space under the larger centerpiece tree. These might be smaller fruit or nut trees. Next, you need nitrogen-fixing plants in the legume family to enhance soil fertility. And, finally, select groundcovers and pest preventers such as herbs. Once you have selected your centerpiece tree, ensure good workable soil around its root zone. You will be planting trees and plants of successive heights and spreads to create a filled area defensible against weeds and moisture loss. Depending upon the amount of light that reaches the area under the tree, some of the options for larger plantings might be berry bushes, citrus trees, and other small producing bushes. The actual combinations will depend upon your planting zone, the amount of light and your food preferences.